Plums | Honeywood (Dr. A. J. Porter) Heritage Nursery Inc.
PLUMS: Parkside – 1963 – Salicina (Manchurian) x native Manitoba plum – 1963 Price List description – A cross between Salicina and our native Manitoba plum selected here. Fruit up to 1 ¾ inches, thin skinned, and very good for eating out of hand. Ripe early in September. Except for size, as good as the large red plums that come in from B.C.. Pit very small. Tree vigorous and hardy. pollinated seedling of Parkside. It ripens earlier and is a better quality plum than its mother. Fruit is red with a lilac bloom, up to 1 – 1 ½ inch, orange flesh, very firm for this class and will keep some time after being picked. Quality is pleasant and slightly aromatic to eat out of hand. Makes an excellent red jam. Tree is upright to about 8 feet. Fully hardy here. It is the most consistent cropper here of any of these plum trees. Even in 1980 there was a light crop of fruit in spite of the frost. Nearly all others in this type of plum had no fruit at all. 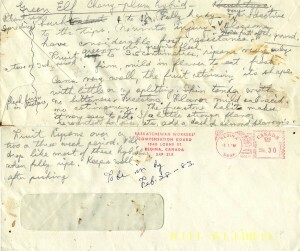 Mistawasis – date unknown – description from article by Allan Daku – From a batch of Manchurian plum seed that Bert obtained from the Research Station at Morden, one plant stood out after he’d grown them to fruiting size. It had a large spreading bush and bore good sized purplish red fruit of excellent fresh eating quality. Bert named this plum ‘MISTAWASIS’ after an old chief of that reserve that Bert remembered from his childhood because the chief wore his hair long. ‘MISTAWASIS’ plum unfortunately proved very prone to leaf spot and was never listed in the catalogue and was soon discontinued. Green Elf – date unknown – This variety is the result of a cross of Manchurian plum with sandcherry. The following is a excerpt from the article written by Allan Daku for the history book. – Bert has recently named one ‘Green Elf’. This bears smallish green fruit with a particularly fine eating quality. While not yet in the commercial trade, ‘Green Elf’ will undoubtedly prove popular. 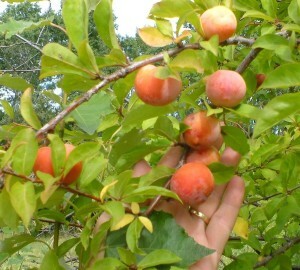 An assortment of plum trees still grow throughout the nursery, it is not known at this time if any of them are the Porter plums as described above. 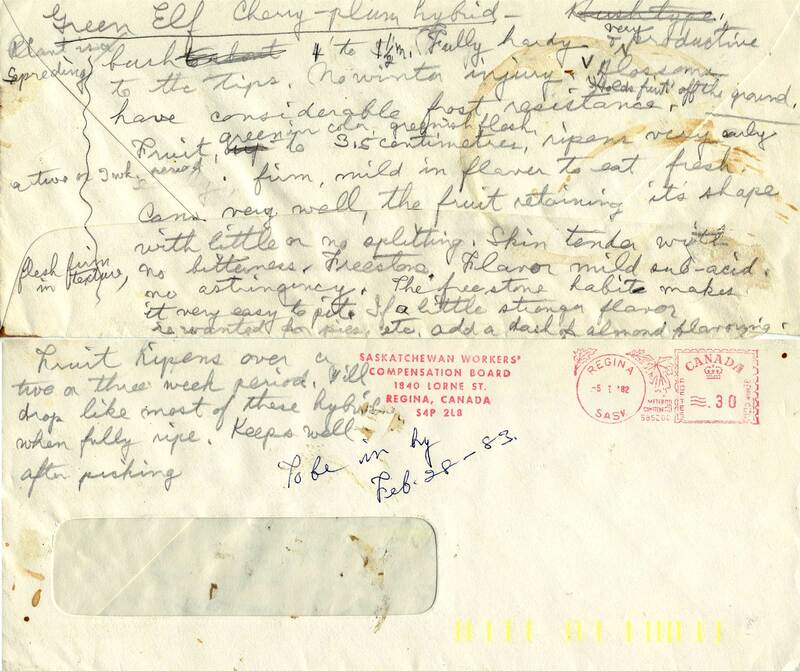 The following is taken from notes written on an envelope by Bert Porter Green Elf: Cherry – Plum Hybrid Plant is a spreading bush 1 (4)’ to 1 ½ m. Fully hardy & very productive with blossoms to the tips. Holds fruit off the ground. No winter injury & have considerable frost resistance. Fruit, green in color, greenish flesh, up to 3.5 centimetres, ripens very early a two or 3 wk period. Firm, mild in flavor to eat fresh, cans very well, the fruit retaining it’s shape with little or no splitting. Skin tender with no bitterness, flesh firm in texture, Freestone. Flavor mild sub-acid no astringency. The freestone habit makes it very easy to pit. If a little stronger flavor is wanted for pies etc. add a dash of almond flavoring. Fruit ripens over a two or three week period. Will drop like most of these hybrids when fully ripe. Keeps well after picking.